Ganesha, also spelled Genesha, Ganesa or Ganesh, is one of the deities best-known and most widely worshipped in the Hindu pantheon. His image is found throughout India and Nepal. Regardless of affiliations Hindu sects worship him; his primary function in their mythology is being the master and remover of obstacles. 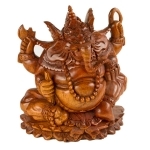 Although he is known by many other attributes, Ganesha's elephant head makes him particularly easy to identify. Ceremonies are held dedicated to Ganesha before new ventures are undertaken and many prey to him in times of struggle and hardship.